At a press conference hosted by the MIDWAY GROUP, Mobil 1 and the New York International Auto Show at the Jacob Javitz Centre in Manhattan, New York, the Mazda2/Mazda Demio was declared the 2008 World Car of the Year. The Mazda2/Mazda Demio was chosen from an initial entry list of thirty-nine (39) entries nominated by forty-seven (47) World Car jurors from twenty-four (24) countries throughout the world. Each juror was appointed by the World Car Steering Committee on the basis of his or her expertise, experience, credibility, and influence. Each juror typically drives and evaluates new vehicles on a regular basis as part of their professional work. WCOTY jurors observed that, “This fresh Mazda compact makes the first-generation one-box-ish Mazda2/Demio fade into the mists of time even more so. The new version is exactly that – completely new; particularly on the outside. The two-door sportier look was recently unveiled at the Geneva Motor Show and reviews around the world have been primarily one big ‘thumbs up’. Consumers will be drawn to the new Mazda compact because of its very appealing looks and high levels of standard equipment for the price”. The top three contenders for 2008 World Car of the Year title were, in alphabetical order, the Ford Mondeo, the Mazda2/Mazda Demio and the Mercedes-Benz C-Class. 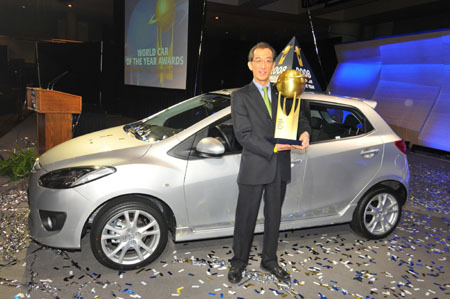 “We are honored to receive this prestigious award recognizing the Mazda2/Mazda Demio as the 2008 World Car of the Year”,,” said Dan Morris, Mazda’s senior managing executive officer in charge of Marketing, Sales and Customer Service. “This is wonderful recognition which Mazda2 car owners and Mazda employees alike can celebrate worldwide. Previous World Car of the Year winners were the Lexus LS460 in 2007, the BMW 3-Series in 2006 and the Audi A6 in 2005. 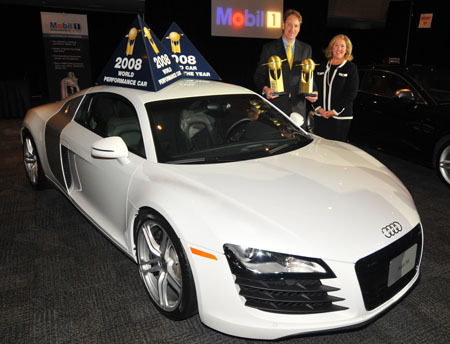 The 2008 World Performance Car award, presented by Mobil 1, went to the Audi R8. Candidates for the World Performance Car award must demonstrate a specific and overt Sports/Performance orientation. They must also satisfy the same availability criteria as for the overall World Car award and may be chosen from that list of eligible vehicles. Additional entrants may include newly introduced variants that satisfy the same criteria, but are derived from existing rather than brand-new models. In all cases, they must have a minimum annual production rate of five-hundred (500) vehicles. Previous World Performance Car winners were the Audi RS4 in 2007 and the Porsche Cayman S in 2006. The BMW 118d with Efficient Dynamics was declared the 2008 World Green Car. Jurors felt that BMW’s EfficentDynamics technology, as applied to the 118d, comprises a range of features and improvements with the specific purpose of reducing fuel consumption and lowering emissions. Its 143-hp, 2.0-litre turbo-diesel engine, with third-generation common-rail fuel injection, piezo-injectors, and up to 2,000 bar injection pressure is said to reduce fuel consumption by up to eight percent. The top three contenders for the third annual World Green Car in addition to the BMW 118d with Efficient Dynamics were the Mercedes-Benz Smart fortwo cdi and the Volkswagen Passat 1.9 TDI. Previous World Car winners were the Mercedes-Benz E320 Bluetec in 2007 and the Honda Civic Hybrid in 2006. The Audi R8 was declared the 2008 World Car Design of the Year. Cars eligible for the 2008 World Car Design of the Year award are taken from the list of thirty-nine (39) World Car candidates nominated by forty-seven (47) World Car jurors from twenty-four (24) countries throughout the world.
. Akira Fujimoto: Editor-in-Chief, Car Styling magazine. Jurors then voted on the expert’s recommendations. The top three design finalists were, in alphabetical order, the Audi R8, the Mazda2 / Mazda Demio and the Volvo C30. The World Car Design of the Year category, and the corresponding award, is meant to highlight new vehicles with innovation and style that push established boundaries. Previous winners of the World Car Design of the Year award were the Audi TT in 2007 and the Citroen C4 in 2006. Now in their fifth year, the annual World Car awards have become one of the most prestigious and credible programs of their type in the world. The awards were inaugurated in 2003, and officially launched in January 2004, to reflect the reality of the global marketplace, as well as to recognize and reward automotive excellence on an international scale. The awards are intended to complement, not compete, with existing national and regional Car of the Year programs.